(Newser) – Hikers on the Pacific Crest Trail can expect to encounter harsh-but-beautiful landscapes, extreme fatigue, and—these days, at least—traffic. "You can’t talk about the Pacific Crest Trail without mentioning the crowds," Pete Brook writes for Outside. He should know: Brook currently is trekking the 2,650-mile PCT, which runs from the Mexican border through California, Oregon, and Washington to the border with Canada. But don't take his word for it: The Pacific Crest Trail Association so far this year has issued more than 4,000 permits to people planning on tackling at least 500 miles of the trail. To put things in perspective: 300 people attempted to complete the entire PCT in 2006, according to the AP, with about 120 of those making it. In 2014, 1,000 people set off and about half completed the trail. More traffic means more stress on the land, more improperly disposed of poop, and more inexperienced hikers requiring rescue. the problem is that tree hugger psychos hate people. Much of the problem is people don't know trail protocols. I had a HPER class in college that tackled the issue. I didn't really need the class as I had already attended orienteering trips on the Ouachita trail. But it was 3 hours of electives so I went for it. You first plan out your gear and then you buy it. All told the gear will cost way more than the class. Now this was 32 years ago and we did not have an abundance of camping stores and the ones we had were high end. So I did order a lot of stuff from places like Campmor. You could also order from Coleman as in that time period, they had not yet moved manufacturing to Singapore. We did use their MSR stoves and white gas. The packs, bags, and rainflys were all Kelty. Rainflys were our only shelter. Then we had an assortment of all the other gear. Our food was based mostly on freeze dried meats like shrimp, chicken, beef, and turkey. We had none of that expensive Mountain House stuff. If you toss in a good spice bag, some pasta, rice, and stuff you can be a literal gourmet on the trail. I've kept with this system to this day and the only shortcut I make are the Lipton side kits which are quite good and all you do is add water. You can add freeze dried meats to their side mixes and they are quite good with just a few more spices. Ok, so we encounter people with bad trail protocol like camping right on the main trail. Really, do you own that part of it? They use camp benches as toilets. Really, you go out and find a fallen tree, dig a hole, do your biz, and bury the paper with it. You pack out any trash you may have although our system minimizes it to almost nothing. 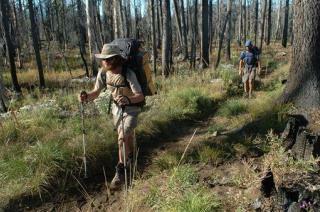 We also do trail mantenance with the prior approval of the park or forest service. That includes low hanging limbs, stuff fallen on the trail, and trash at less primitive park or camp sites. When we camp, the goal is to not be seen by anyone else on the trail. When we break camp, it should only look like some elk bedded down there recently, that's it. The MSR stoves are necessary so we don't build campfires. We only do a fire if we break from practice and camp out at a park in order to give the guys a chance to clean up and swim in a park lake or something like that. Insanely crowded? All I saw was a statistic of 4000 people permitted for a 500 mile trail. Even if they were all on it at the same time, that would only be 8 people a mile.